Bridal couturier Celest Thoi takes BAZAAR through her ambitions and modern oriental home. By Emmilyn Yeoh. Photographed by Chee Wei. As a bridal couturier, Celest naturally has to be a romantic herself. She sees the act of marriage as a journey into the unknown, similar to her experience of moving back to Kuala Lumpur. Before meeting her husband, James Tee, Celest had envisioned a city-girl life in Melbourne; starting her sunny morning with the farm-to-fork Abacus Bar & Kitchen in South Yarra, walking down Flinders Lane, the ex-fashion, now-hipster hub, and hunting down the best produce at the bustling Prahran market to make her famous shepherd’s pie. “A fun night out begins with ‘experience dining’ at Attica Restaurant with Chef Ben Shewry, where each engaging and playful course highlights a native Australian ingredient. After that, it’s walking down the opium-den-inspired Golden Monkey, hidden away in Hardware Lane, adorned with ’80s Chinese vintage posters and old-school wicker lanterns,” she says, recalling her most nostalgic moments. Her life then took a 180-degree turn when James proposed, and Celest found herself swapping her metropolitan lifestyle in Melbourne to settle down in Auckland instead. Extreme sports and outdoor activities were not to her taste, and soon the slower pace of life caught up with her. A career in fashion design had been brewing in her mind, and there was no better moment to take a courageous leap: she was going to start a new life in a new place. Fresh from her wedding, the new bride started taking night classes on fashion design and flower arrangement, determined in her quest of creating the dress for blushing brides. “Back then, I had a hard time finding a suitable design that flattered my petite frame. I just wanted to make dresses that people would say yes to!” she laughs. Constructing feminine and sophisticated dresses for the modern, strong female on the daily, Celest’s craftsmanship is inspired by her favourite fashion houses such as Saint Laurent, Dior, and Valentino. 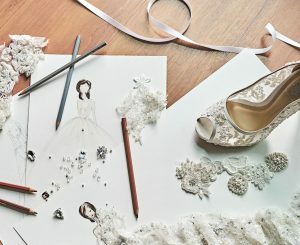 “I love how Saint Laurent has toughened up the look of a feminine woman with chic, avant-garde designs, whereas in haute couture, the gowns from Dior and Valentino are just breathtaking, elegant, and ethereal.” Here, in Malaysia, Celest tries to offer more crucial elements of the haute couture process in her bespoke bridal services. “Getting the right fit for your bridal gown is most important to us, which is why I am looking to introduce the process of calico fitting, where a mock-up of the dress is made to ensure a perfect fit,” she describes. Celest’s go-to favourites include an Annick Goutal fragrance, chain bags, a statement necklace, and dainty earrings. The contemporary oriental sofa is the newest addition to Celest’s living room. Celest’s attention to detail does not stop once she kicks off her heels and gets into mummy mode. 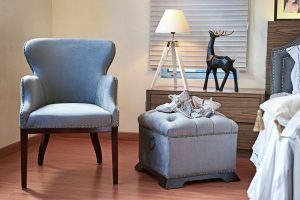 Nestled in the lush grounds of Bukit Segar, Cheras, she has injected contemporary accents to complement the oriental theme of her home. In the living room, red-and-white patterned curtains are set against wooden panelling, while a bamboo lamp hovers over the grey sofa with black Chinese motifs made of rosewood. To glam it up, she has chosen a large carpet with a single pastel peony print. As we weave our way through her spacious four-storey home, we pass by a majestic marble spiral staircase that looks like a proper workout on its own. Sensing our reservations, Celest makes a dash for the elevator and jokes, “I’ll see you up there!” Two long floors later, we find ourselves at her bedroom, where she spends most of her time sipping on chamomile tea, reading, and sketching. Here, she has chosen a modern black-and-white aesthetic. The walls are lined with monochrome stripes, adorned with past campaign shots and wedding photos. Next to her bed is a life-sized trunk filled with little trinkets, sky-high heels, panama hats of every style, and minimalist accessories. In her walk-in wardrobe hangs a modern white crystal chandelier that is sure to dazzle any guest. “This is my favourite part of the house as it reflects my personality. I like to envision everything in black and white, before adding a dash of colour to jazz it up,” she says.